Britain will end the year with five world champion boxers in heavyweight Anthony Joshua, super-middleweight Callum Smith, featherweight Josh Warrington, super-flyweight Kal Yafai and flyweight Charlie Edwards. It has been a fantastic 12 months for each of them. But 2018 was not just a good year for British fighters and there were plenty of brilliantly entertaining bouts both at home and abroad. A YEAR after the pound-for-pound best fighters on the planet battled to a draw, the two men went at it again in a rematch that was nearly as close. There were no knockdowns but both Canelo and Golovkin boxed beautifully, with the Mexican claiming a majority 115-113, 115-113, 114-114 victory. 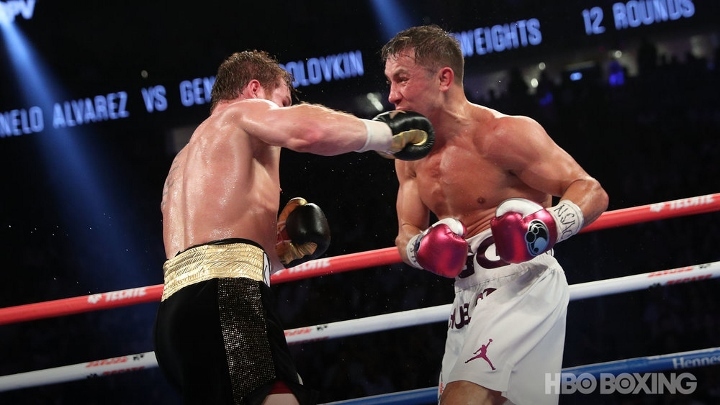 Triple G was furious at the decision, believing he had done enough to win the fight, and plenty of those who watched the fight agreed with him. Or that Canelo had not done enough to win. However, two of the three people who mattered said he did and they scored the contest Alvarez’s way. FURY completed his remarkable return to world championship boxing three years after dethroning Wladimir Klitschko to become the IBF, IBO, WBA and WBO champion. Just as he was in 2015, the Gypsy King was the underdog going into the fight with Wilder but for much of the first half of the contest he made the WBC world heavyweight king look average. Wilder then put Fury down in the seventh round and when he did so again in the 12th it looked like game over for the challenger. Incredibly, though, Fury beat the count and took the decision to the judges. The fight ended a draw despite many observers scoring it in Fury’s favour and the Mancunian himself believing he should now be a world champion once again. The two men are set for a rematch in 2019. A 25,000-strong Elland Road crowd saw Leeds lad Josh Warrington dethrone Lee Selby to claim his IBF featherweight title. Selby had been the favourite for many but by his own admission, he realised as soon as the first punches were thrown that he was weight-drained. Take nothing away from Warrington though, he boxed superbly and raced ahead in the early rounds. Selby, who was cut above both eyes by an accidental clash of heads, was unable to recover, with Warrington winning a split decision. THE World Boxing Super Series super-middleweight division final saw Smith claim his first world title with a blistering ­performance. The pedigree of Groves, who defeated Chris Eubank Jr in the semi-final, had established him as favourite going into the fight. He was, after all, the much more experienced fighter at world level, having been in with some of the biggest names in the division over the years. But after six tight and entertaining rounds, Smith exploded into action and delivered a stunning knockout victory in the seventh to claim Groves’ belt. RUSSIAN Povetkin came into the fight on the back of a crushing knockout victory over David Price. And Joshua knew that any gaps in his defence would lead to danger against such a heavy-hitting opponent. But despite having to weather some anxious moments in the early rounds, the WBA, IBF, IBO and WBO heavyweight champion never lost his cool. He retained his titles with with a brutal onslaught in round seven as his opponent began to tire.